I’ve tried these edits before. 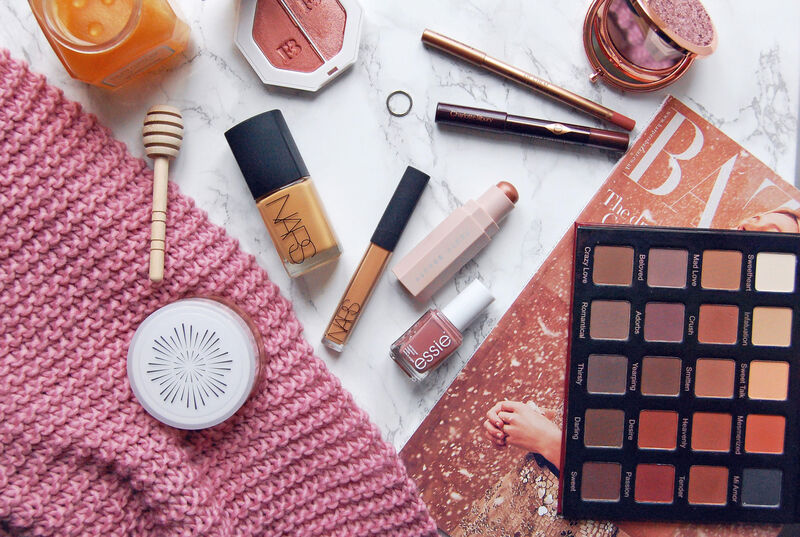 I add a few seasonal bits to the storage on my desk; a deep berry blush I prefer in winter, a grey nail polish, and a glow giving foundation instead of my usual matte – you know how it goes. I switch eye looks every few days – usually a tussle between a deep Burberry-esque brown, and an Anastasia Beverly Hills orange or rusty red. And this is just my day time look! But these pre-planned seasonal edits never work for me. This here just happened. I guess it’s no surprise my favourite thing I own right now is the Violet Voss Matte About You palette. Some days, I rock up to work five shadows deep and five minutes late, all because I got carried away. Crush is for days I crave a bit of darkness, but the mature not gothic kind because I’m in my late twenties and we’ve moved on, and Smitten and Heavenly are my everyday quick fix. And because it’s 2018 and we’re only giving money to brands that respect and cater to us dark and deep dark girls, my base is all NARS and I’ve got my Fenty Beauty Killawatt Freestyle Highlighter Duo ready to go. Ginger Binge (left) is a subtle sheen, and Moscow Mule (right) is for beaming ships into port at night. Kind of like Rihanna's glow at the Met Gala last year. So far, I’ve only used my Match Stix Shimmer Skinstick in Sinamon, on my eyes, but I’ll give it a whirl on the high points of my face at some point. It’s shimmery and creamy, but hardly OTT. Evening eyes I’ll leave to my Charlotte Tilbury Colour Chameleonstick in Bronzed Garnet, which makes my onyx coloured eyes dance in the light. But I’ve always got to balance eyes and lips and nails out, so for a softer touch I’ve been using the Charlotte Tilbury Lip Cheat in Pillow Talk, and Essie’s Clothing Optional on my nails. At least for now, this line up is it. Now if only it could be a little colder, I’d be fully satisfied.